Binding: Full box calf leather laced-in binding with edge-to-edge doublure with suede flyleaf. Inlays and sharp-edge raised leather mosaics. 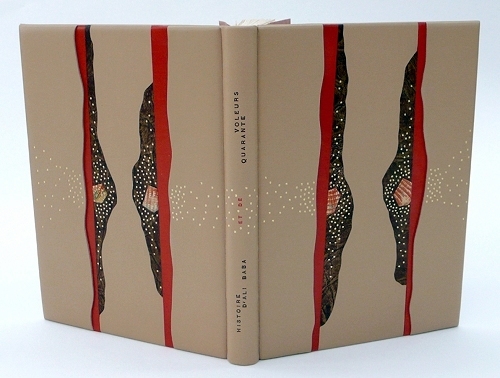 Gold dots on both covers and French style titling on spine. Cécile Côté is a bookbinder from Montreal who also dabbles in the art of letterpress printing. As well as creating original works, she offers binding and repair services. She gives bookbinding lessons and hosts workshops often bringing together bookbinders and students from North America and Europe. Cécile is always striving to learn new techniques and continues to perfect her craft. An admirer of poetry and the written word, she opens her studio for poetry readings where good humour and lots of tea and cookies are shared. Our warm congratulations go to Cécile for this stunning binding and for winning the 'Fine Binding' category in this year's competition.